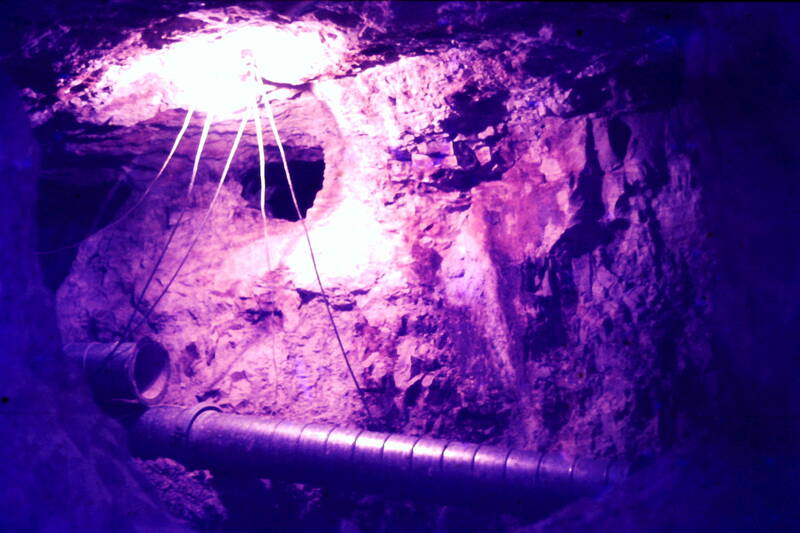 Opal is currently being mined from depths between 1 metre (3 feet) and 30 metres (90 feet) below the surface. The opal is found in sedimentary rocks that were deposited in a freshwater environment during the Cretaceous period, about 110 million years ago. There are more than 200 distinct opal fields on the ridges of Cretaceous rocks surrounding the town of Lightning Ridge. These opal fields may be isolated or occur in groups. The main opal field "groups" are located at Lightning Ridge, Coocoran, Grawin/Carter's, Glengarry/Sheepyard, Wyoming, Jag Hill and Mehi. 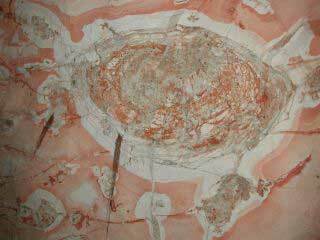 A number of theories, or models, exist for how opal was formed in the Lightning Ridge region. Precious opal is the valuable form of opal which shows colourful patterns that result from the diffraction of light in a process similar to how the colours of a rainbow are formed. Good quality opals will show some variation in their patterns and colours as they are viewed from different angles, for example when they are turned in the hand. Potch, or common opal, is generally of no value compared to precious opal as it does show any diffraction of colour. Common opal occurs far more abundantly in the opal mines than precious opals. Nobby opal is a type of opal that is found as rounded nodules from the size of a pea to as large as a potato. 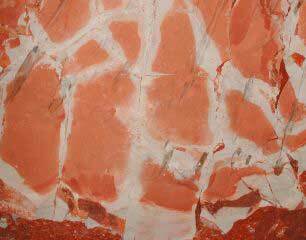 Seam opal is usually found as a horizontal layer, or seam, in the opal bearing rocks. Fossil pseudomorphs (false forms) are plant, shell, bone or teeth fossils which have been replaced by opal. Most opal is recovered from the upper 0.3 to 0.5m of a claystone (fine grained) rock layer that is immediately overlain by a layer of sandstone (coarser grained). Opal tends to be more common in the claystone layer near faults (large cracks), blows (areas of heavily fractured rock, also know as breccia) and joints (smaller cracks) in the rock. Currently most opal mining occurs at depths between 5m (15 feet) and 27m (80 feet) and generally involves the extraction of a single layer of opal bearing claystone. In some areas two or more layers may be mined. Sandstone (orange) overlying opal bearing claystone (lighter), Coocoran opal fields, Lightning Ridge. 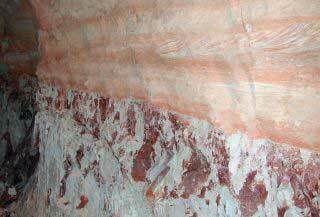 Fault plane (smooth surface) exposed in the sandstone roof of an opal mine, Coocoran opal fields, Lightning Ridge. Blow (light coloured circular area) about 1.2 metres across exposed in the sandstone roof of a mine, Coocoran opal fields, Lightning Ridge. 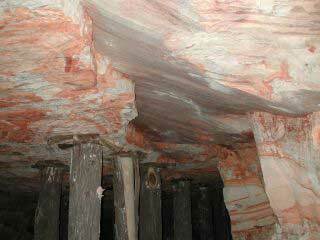 Joints (light coloured) exposed in the sandstone roof of a mine, 3 Mile opal field, Lightning Ridge. Opal miners find occasional plant stems and shells which have been opalised, usually as potch but sometimes as precious opal. Rarer still are opalised bones and teeth of various vertebrate animals such as turtles, lungfish, crocodiles, pterosaurs, plesiosaurs and dinosaurs. These and other fossils have been used to determine that the opal bearing rocks were deposited during the Cretaceous period, about 110 million years ago, in a freshwater environment. 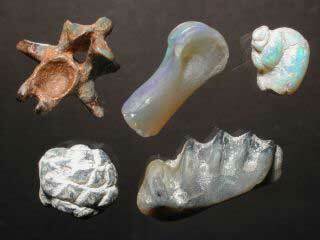 Opalised fossils, top left - turtle vertebra, top middle - dinosaur leg bone, top right - gastropod (water snail), bottom left - pine cone, bottom right - lungfish tooth plate. (A) Deep weathering model - During the Tertiary period the rocks which now contain opal were subject to significant weathering. Over time small amounts of silica tended to be leached from sandstone layers by water which then passed through the rock until it became trapped by underlying layers of relatively impermeable claystone. 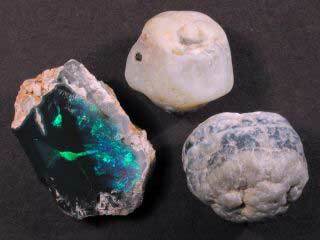 Under the right chemical and physical conditions opal was precipitated from the water in porous areas or voids. 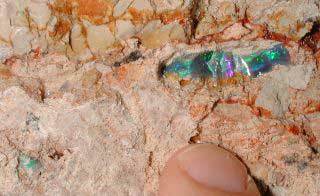 There is a tendency for opal to be found close to faults in the rock layers and near "blows" (disturbed ground). If this model is correct then these faults and blows would have provided paths for water containing silica to flow along. (B) Syntectonic (Pecover) model - Opal was deposited by heated water under pressure which originated from underground. The water tended to flow preferentially along faults and blows and deposit opal nearby. (C) Microbe model - Opal bearing claystones commonly contain substantial amounts of fine, fossilised organic matter. Various types of microbe fossils, primarily aerobic (air dependent) bacteria, have also been identified as fossils within opal. Although the microbe fossils are not visible to the naked eye, microscopic studies have shown them to be quite abundant. Under this model the ongoing feeding and waste production processes of the microbes, while they were alive, created favourable physical and chemical conditions for the formation of opal. Ultimately each of the above models for opal formation has its strengths and weaknesses, with more scientific research required to clarify whether opal has formed by one process or a mixture. The following books and papers will provide more information on the geology of the Lightning Ridge opal fields. Breccia Pipes and Faults at Lightning Ridge, Pecover, S.R., 1999, Opal Ventures N.L., Sydney. Cretaceous Microbes – Producer of Black Opal at Lightning Ridge, NSW, Australia, Behr, H.J., Behr, K. & Watkins, J.J., 2000 Unpublished paper. Future Prospects for Opal Mining in the Lightning Ridge Region, Watkins, J.J., 1985, Department of Mineral Resources. Black Opal Fossils of Lightning Ridge, Smith, E. & Smith, R. 1999, Kangaroo Press, East Roseville, NSW. Text and pictures (C) 2002 Matthew Goodwin.